Bonefishing is a sport unlike any other, even unlike any other type of fishing. 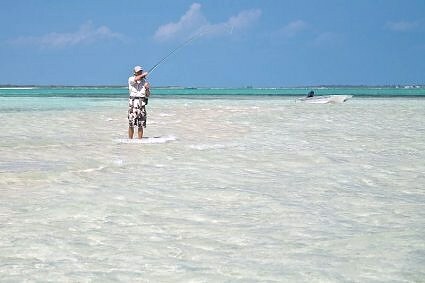 And there are only a few perfect bonefishing areas, one of which is Andros Island in the Bahamas. To try your hand at bonefishing, it is easy to visit Andros Island on a yacht charter in the Bahamas. As the largest island in the Bahamas, Andros Island is also the least populated, unless you count bonefish and there are thousands of these tough fighting fish. 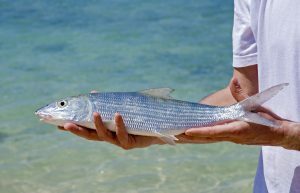 And, Andros Island bonefish are reputed to be some of the largest bonefish in the world, so it is even possible to catch a trophy sized bonefish on a fishing expedition during your charter. Include Andros Island in your Bahamas yacht charter itinerary and stalk the wild bonefish on your next charter. Andros Island has miles of sandy cays hovering just under the surface of the water, which is the ideal feeding ground for bonefish. Fishing for bonefish requires a flat bottomed skiff and pole to glide through the shallow water covering the sandy cays, or high boots for stalking through the shallow water. Catching bonefish is a game of stalking rather than fishing. First the bone fish must be isolated and separated from the rest of the school, and then the game is on. Of course, finding the bonefish is the first challenge as they blend into the sandy surrounds, so that often the only telltale is the shadow of the bonefish seen on the bottom. Once a bonefish strikes your lure, expect a swift run out of over 100 feet of line as the bonefish tries to shake the hook. As one of the swiftest and strongest game fish, it is then up to you to bring the fish in, which is the true test with this fish. And one or the other of you will win, and often with bonefish, it is the fish! Head over the Andros Island on your next charter in the Bahamas and spend an afternoon stalking the bonefish across the sandy submerged cays. Contact Northrop and Johnson For More Information!